"Our Paraprofessional Accounting Program is one of a kind. Students are trained by practicing CPA's in the actual practice of accountancy--how it's done in the real world. Students wanting to pursue a professional degree after graduating will delight in knowing that 70 percent of credits earned will transfer to most senior institutions." 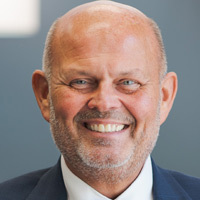 Before coming to Walters State in 1982, Mr. Barnett was associated with the international accounting firm of Deloitte Haskins & Sells (now Deloitte Touche). In addition to his duties at Walters State, Mr. Barnett actively practices public accountancy providing financial and tax accounting services and consulting services to a variety of clients. Mr. Barnett also serves as chief financial officer of a closely held corporation operating restaurants in upper East Tennessee. Mr. Barnett is a member of the American Institute of CPA's and Tennessee Society of CPA's.